Jo Sykes is the daughter of the celebrated artist and sculptor Charles Sykes, whose most famous work has adorned nearly every Rolls-Royce car since 1911. 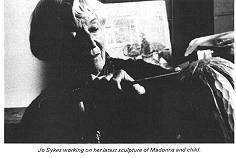 Interestingly, in this article Jo Sykes - an accomplished sculptor in her own right - dismisses outright the popular legend that Eleanor Thornton was the model for the Spirit of Ecstasy. Read on and make up your own mind! "The "Spirit of Ecstasy" has selected road travel as her supreme delight and has alighted on the prow of a Rolls-Royce car to revel in the freshness of the air and the musical sound of her fluttering draperies." These are the words of the celebrated artist Charles Sykes in describing his fairy-like creation "Spirit of Ecstasy" or "Flying Lady" as she has become erroneously but more commonly known. This lovely piece of sculpture, for over 50 (fifty) years so well known among lovers of fine motor cars, originally appeared on the Barkerbodied Silver Ghost tourer belonging to Lord Montagu of Beaulieu, the man who initiated her creation at a time when the most tasteless of mascots were to be seen perched upon radiators of all too many British cars. Legend has it that Lord Montagu's secretary Miss Eleanor Thornton was chosen by Charles Sykes to be the model for the "Spirit of Ecstasy." This is not the case however as she was of a rather statuesque build, not at all the type to suggest the delicately poised fairy figure that Sykes had in mind for the radiator cap of the Roils-Royce bonnet. However Miss Eleanor Thornton was a very great friend of Charles Sykes and his wife Jessica and their small daughter Jo who remembers her very well. She did indeed pose for many of Charles Sykes bronzes notably the ""Bacchante", "Phryne", the woman in the group called "The Arcadians" and other works. These were exhibited in the Royal Academy Summer Exhibitions and the Salon de Paris in the years 1910, 1911 and 1912. "arrangements are being made by which an owner of a Rolls-Royce may acquire one of these figureheads for a few pounds." However the "Spirit of Ecstasy" did not become standard equipment until 1921. In 1920 Rolls-Royce entered the "Spirit of Ecstasy" in the "Concours Mondiale des Bouchons d'Automobiles" organised by the magazine "L'Auto." Charles Sykes was presented with the gold medal awarded by "L' Auto" much to his great joy and surprise as he had no idea that the Company had entered his pet creation. In 1928 Jo Sykes his daughter (also an artist and sculptor) took over the finishing of the individual mascots and conducted the business side in order to release her father for other pressing commissioned works. But always the same care in production was maintained, father and daughter often working together on rush orders. Lord Montagu of Beaulieu, returning from India to England in 1915 in the S.S. Persia which was sunk off Crete, was one of eleven survivors picked up by the steamer "Nung Chow." He arrived in England to read his own obituaries. Unfortunately Miss Eleanor Thornton perished along with the majority in that ill-fated ship. She was deeply mourned by all her friends and in particular by Charles and his wife Jessica. Their daughter Jo remembers how often through the years "Thorn" was talked of with affection and admiration.